This topper spirit, yclept the Germanic racial inclination towards bibacity, this bragging of bibulous achievements, for which, as heroic deeds, admiration was exacted, were clearly remnants of the medieval temper, and were transmitted to modern times, although the present age has doubtless sobered down, even if, now and then, there is still something shown of this medieval awe and respect for the unsubdued knight of the bowl. This sentence is thronged with alliteration, commas, idioms and breathless, mellifluous vocabulary. Love it! A few weeks ago, Science Friday had a segment that featured Charles Spence, author of the book Gastrophysics: The New Science of Eating. Spence is investigating how sounds enhance your victuals. He conducted an experiment some years ago at a seafood restaurant. Some diners listened to the sound of cutlery and others listened to the sounds of sea. Those who listened to the sea rated the sea as better tasting or enjoyable. The experiment (referenced in the Journal of Sensory Studies in 2010) shows how sound might be used to emphasize or draw people’s attention to certain flavors of the dish. … In light of findings like these … it would be smart for cooks, restaurants, and others involved in food marketing to understand how music might influence the taste of their food. Following that there is anticipation of the food or drink (like when you know someone at home is making some chocolate chip cookies and it’s all you can think about all day); then there’s seeing the thing, tasting the thing, the ambiance of the venue (voices, known and unknown; clink or clunk of glasses and plates on table or bar; music.) All these contribute to flavor. Therefore, taste will be different each time and for each person since all of us have our own personal and disparate perceptions. When you visit your local brewery and drink a Locomotive Stout or Legend of Tom it’s possible to be in a crabby mood; the beer may not seem as good as yesterday’s when, in fact, physically, there is no variation. Mood impacts flavor. Mood can be altered by the things noted above. the hedonic valence of sucrose (but not of sodium chloride) solutions were elevated (meaning that people reported liking the solutions more) when listening to either loud noise or music. Friday visitors to Black Bridge Brewery are apt to hear Def Leppard Radio playing via Pandora. The music, whether it be Def Leppard (isn’t that 80s stuff high pitched?) or other selections (for, indeed, one person’s musical proclivity is another’s hullabaloo) drives the ambiance and maybe, just maybe, that adds to pleasure of the whole experience. Music enhances flavor. Interestingly, too, the sweetness of the food or drink was rated better with loud background noise or music playing than when the participants had the same food or drink in silence. recent findings from a 4-year study from the Karolinska Institute in Sweden [which] found that for every 10-dB increase in the road traffic noise levels, there was a 3-cm increase in waist size. More dramatically still, those exposed to loud airplane noise had a waist line that was, on average, 6 cm larger. Loud noises (hi, Brick) will make patrons drink faster. If restaurants, or bars, want more sales maybe they are cranking up the noise, too. More consumption also adds to the increasing waist lines noted above. But that is a level of loudness that prevents talking. Generally, this will not be the case at your local. There, talking is totally possible and music can be the backdrop of connection and an enhancement of flavor. Why Don’t I Home Brew? For good or ill I began making calculations. Let’s talk expense. During this past weekend and the one prior I’ve spent a combined total of approximately $70 on beer, either bottled or on tap at my local. I ran the numbers on the ingredients for a couple of Belgian’s I brewed in ages past and the total came to about $46. Let me now compare volume. I got about 10 beers for the seventy bucks. If I’d spent less money and made my own beer I could have had around eighty beers. Eight times as much beer for thirty four percent less cost. I wag my head. Let’s talk time. On Friday’s I often arrive home from work around 2:30 or 3 pm. The wife comes home around 6. Then we spend a couple hours or more at the pub and at dinner. On Sunday I’ve been napping for over an hour and I’ve set up a regular beer event where a friend or two come to the house and we drink beer for two or three hours and have a nice little chinwag. Now, I don’t want to do away with either of those things. I don’t mind spending money or time on a date with the wife and an afternoon with the guys. However, with a little forethought I might be able to arrange my affairs and have one or two brewdays in a month. Honestly, I could turn Beer Sunday into Brew Sunday! I wag my head again. Thus and so we come to the rub: what’s the real reason I don’t brew? One reason is my lack of confidence. The last batch I brewed was a brown ale laced with cinnamon. I looked forward to it, although the brew day didn’t go as well as I’d hoped. Chilling the wort took so long. Far too long. The beer exploded due to an infection. It was disheartening. And the batch just prior to that didn’t come out so splendidly either. My quality had been diminishing. Some of it could be chalked up to aging equipment, I suppose. But I blame myself. I’ve lost confidence in being able to create decent art in a bottle. Then, of course, I start to wonder if any of my beers were ever that good. People said they were, but, they were friends. Nice friends. The good kind of friends. Maybe they liked the beer just because they were good friends. Certainly, even if that were the case, that would not of necessity preclude further brewing. In fact, if I were a good friend myself I would continue in an endeavor that they found pleasing. What else? I started brewing in 1997. There was not the prodigious amount of home brewing knowledge and equipment out there that exists today. In fact, that lack of copious amounts of zymurgical erudition made home brewing an adventure. It was like being on the frontier, blazing new trails, discovering indigenous styles of beer long hidden. Now, it seems that all the knowledge is out there and the adventure is over. Every other person I meet is a home brewer. That’s not really bad, either. It just means a loss of exclusivity, which is just selfishness and vanity on my part. I resist the idea of spending money on my own hobby. Somehow it just feels selfish. I should spend that money on things for other people or household necessities or other bona fide needs. How do I get past all this? Order some extract. Some hops. A vial of yeast. Let it sit in my kitchen. Staring at me. Daring me to combine these discrete elements into a masterpiece. It’s not like I don’t want to do it. Evil Red is a red in the vein of Red Chair from Deschutes and Flipside from Sierra Nevada; i.e., a new “northwest pale ale”. Only in the Southwest. I like it far more than I should. Katastrophic Humiliation is a barley wine style ale. It is well done if a little light in color for my taste. I also dislike the name, spelling and all. Doesn’t stop me from drinking it, of course. Sister in law showed up, enough said. But, hey, she can be cool and she did buy me beer. Had some more Evil Red and their new Stresstout. 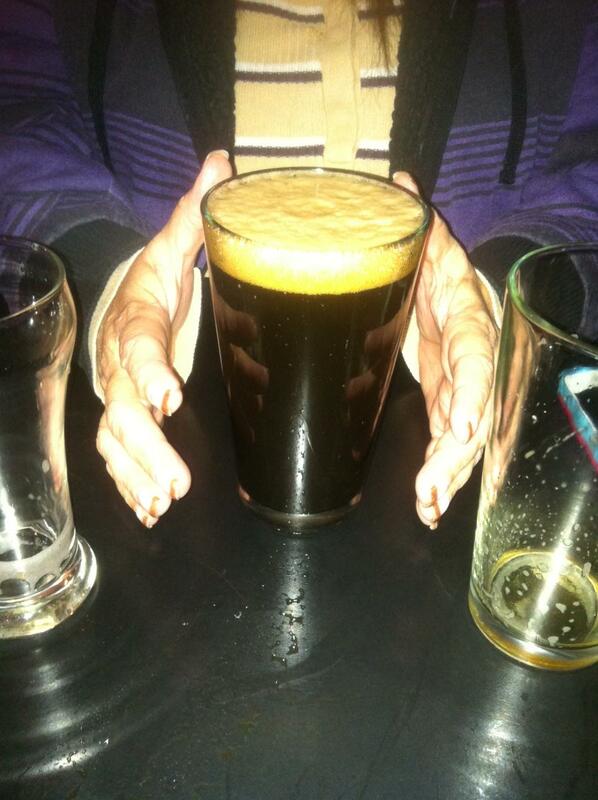 It was a perfect imperial stout, as they say – thick, creamy head, heavy body, coffee foundation, high alcohol. Loved it. I hope there is sweet, iced tea at home. That sounds refreshing right now.